There are a couple of ways you could achieve this tonal effect. You could opt for slightly different coloured food dyes, or play with the amount of food dye you include in each layer of sponge for a light-dark effect. You could play with the way the layers are stacked for a different effect, e.g. light-dark-light-dark or a gradient effect going from light to dark. 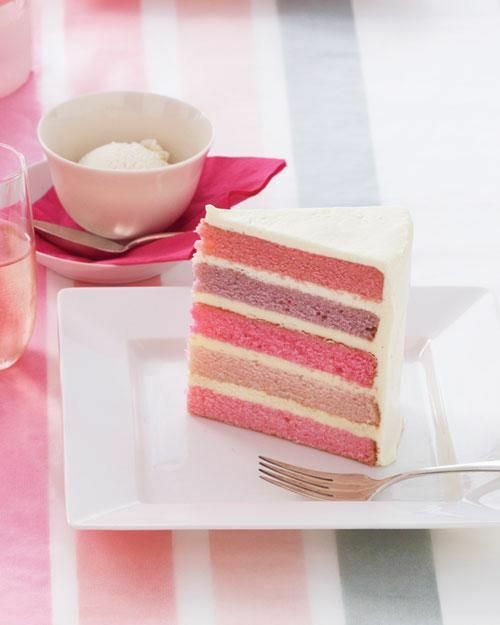 This cake looks very feminine, but you could experiment with different colours, such as blues, greens, reds, etc for a man. What colour sponge would you choose for this cake?